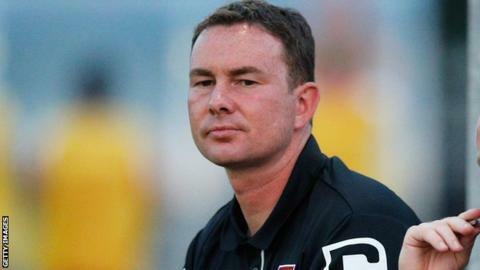 Plymouth Argyle manager Derek Adams is unhappy at the lack of penalties awarded to his side. The League Two leaders are one of just three teams in the division not to have had a penalty this season. Argyle drew 1-1 with Leyton Orient on Tuesday, but felt they should have had a spot-kick when Jake Jervis appeared to have his shirt pulled in the area. "Everybody knows it was a penalty kick, but we don't seem to be getting any penalties," Adams told BBC Radio Devon. "We should have had about 10. It's something we're annoyed about and you can see the reaction of the fans, they certainly told you of what they thought of the game," added Adams, whose side have failed to win four of their last five matches. "It was a stonewall penalty kick, he pulled his jersey back. I saw it from where I was standing and he must have seen it from where he was standing."